Remember the old adage that breakfast is the most important meal of the day? Comal ISD gives students two opportunities to have a nutritious breakfast every day they attend school. What began as a pilot program seven years ago at Canyon High School has become an integral part of many students lives – especially when it comes to their stomachs. The Second Chance Breakfast program, which launched in 2011 at CHS is now available at every middle and high school in the district. Second Chance Breakfast does just that. Served either in the cafeteria at campuses which have a centrally located cafeteria or via food carts, which are pushed along the hallways, this optional breakfast occurs between the first and second periods of the day. This also appeals to students who have an athletics or physical education class first period and find themselves in need of a little extra energy boost to get them to lunchtime. For students such as Church Hill Middle School seventh grader Emilee Spriegel who doesn’t care much for an early morning breakfast, Second Chance Breakfast comes at just the right time. Featuring quick grab and go bags filled with a nutritious entrée and juice, Second Chance Breakfast includes an apple or orange juice and strawberry Craisins or apple slices to round out the meal. Students are not required to take milk, but they must have fruit or juice for the Second Chance Breakfast meal, McKinley explains. In fact, banana bread, zucchini bread, breakfast pizza, chicken biscuit, sausage biscuit, pancake and sausage on a stick and sausage kolaches top the favorites list when it comes to Second Chance Breakfast entrees. On a daily basis, Comal ISD serves an average of 1,047 traditional breakfast meals throughout its secondary campuses and an additional 1,300 Second Chance Breakfast meals. Second Chance Breakfast is just one more way Comal ISD is fulfilling its commitment to ensuring that Student Success Comes First. 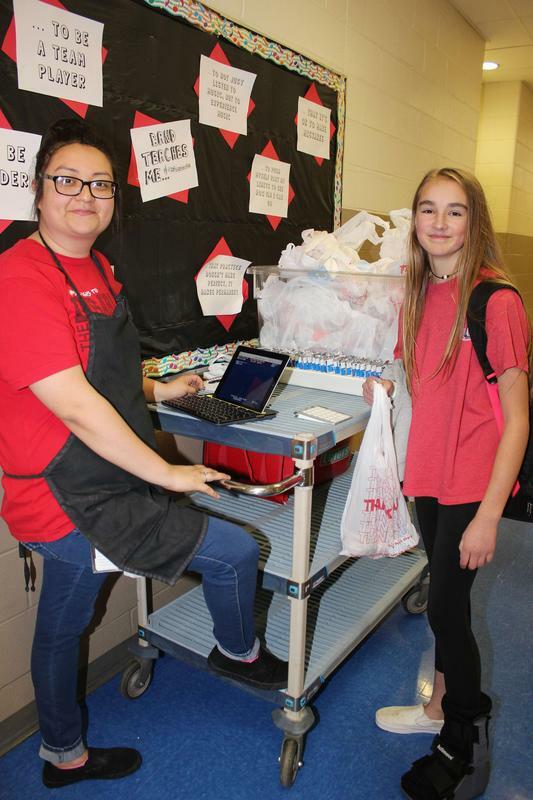 Church Hill Middle School food service specialist Yasmin Patlan serves seventh grader Emilee Spriegel a Second Chance Breakfast grab and go meal. 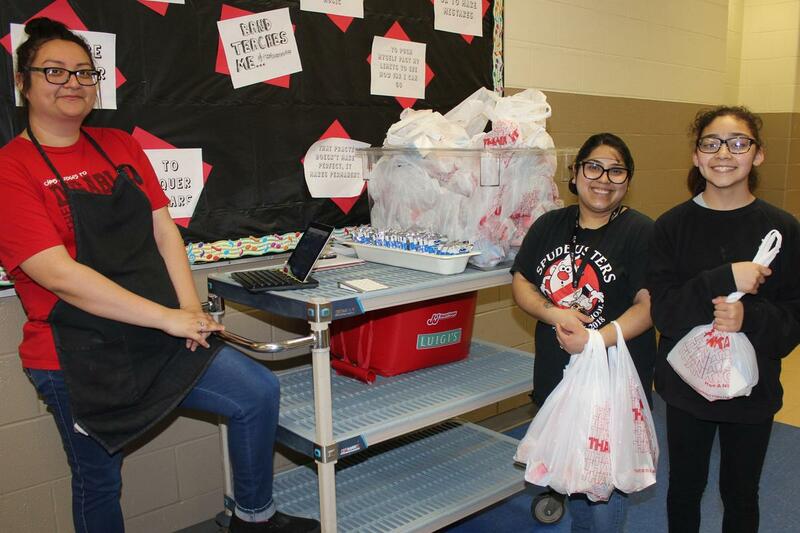 CHMS food service specialists Patlan and Jeanette Rodriguez help seventh grader Mia Goonzalez between first and second period with Second Chance Breakfast. 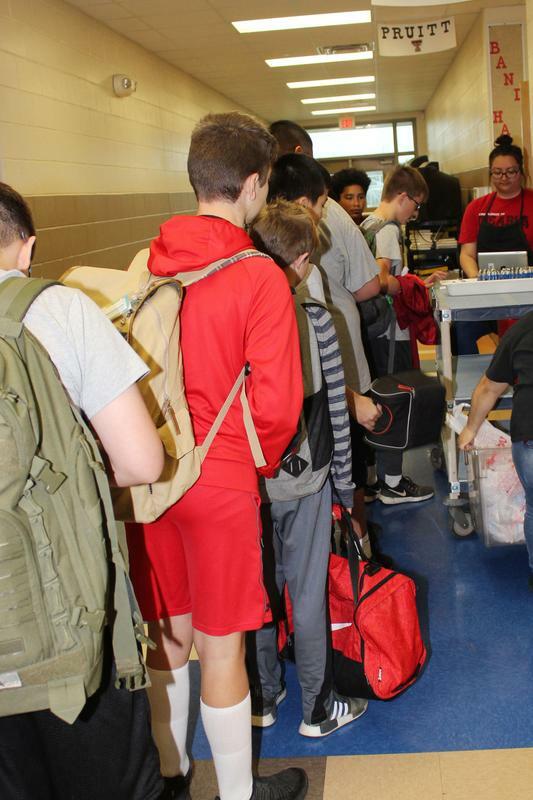 Students at Church Hill Middle School line up daily to take advantage of Comal ISD’s Second Chance Breakfast grab and go meals.